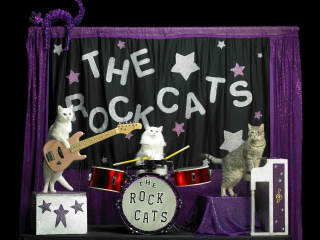 The Amazing Acro-cats featuring Tuna and the Rock Cats are a troupe of real performing house cats. The Acro-cats experience all started with Chief Executive Human (CEH for short) and animal trainer Samantha Martin. She has not only rescued her own pets, but also has found happy homes for over 200 homeless cats and kittens. Using the magic of clicker training (a stress-free positive reinforcement method) Samantha and the cats take their newfound amazing abilities on the road, and tour the nation's stages in the infamous Acro-cat bus. A portion of the proceeds always benefits our mobile foster and rescue efforts. They have cats riding skateboards, jumping through hoops, and Alley, our rising star, has even leapt into the Guinness Book of World Records, holding the record for the longest cat jump.